Well its been a dry spell for me this year.No shots on any deer with my Zipper Nitro unti today. First day of Virginia Muzzle Loader Season and my bud Nook encouraged me to stay at it. So this morning off to one of my Ole Man Ladder Stands. Soon after day break a doe appeared and headed away from me. A few minutes later a rustle of leaves caught my attention and a small 3 pt was chasing a couple fawns. Well the woods became a playground and lots of excitement began. The 3 pt made his way near me walking at a steady pace,18yds full draw and thump,shot right under him. 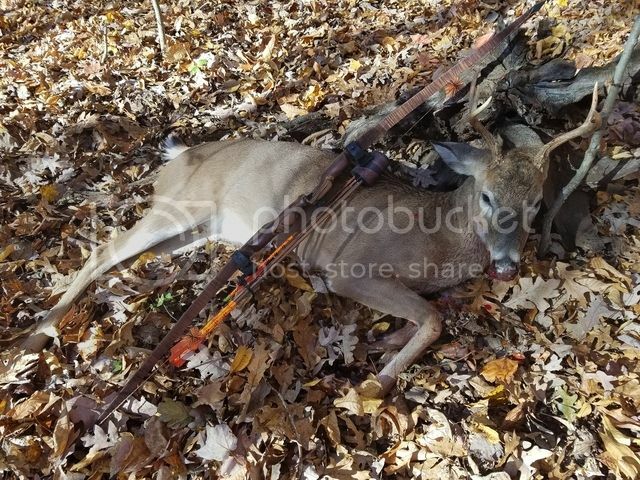 I just shook my head in grief.I waited all season and I blow it.Thats bow hunting. He walks away and I notice a 5 pt making his way and he chases off the 3 pt and takes his does with him. I felt disgusted but happy to have witnessed Mother Natures own plans. Hearing fox hounds in the distance and wondering if they would help me out in pushing deer my way.Around 9:20 two does come from down the ridge at 12 yds but would not stop where I needed to.I again just grinned and shook my head. I noticed that they were looking back up the trail,I eased around and seen the 5pt standing 1o yards behind a small white pine. He was heading down a trail that was presenting a tough shot angle. I seen he wasn't too anxious on coming any further.I picked a spot released a magnus tipped Heritage 75 arrow into the top of the back down into the lungs. He ran off and I didn't know how good the hit was but I saw him go out of sight and thought I heard a crash. Got down 30 minutes later and started finding blood within 10 yards. The trail was easy to follow and after 100 yards or so there lay my trophy of the year. I almost gave up this year but really glad I didn't and the feeling of this reward reminds me why I do this..A big thanks to Nook for sharing this memory and helping me drag. great job buddy! All those 3D targets that we shoot all year finally paid off!! Way to go buddy, Leah said it's about time! Nice one Danny. I knew you would come through! Great day in the deer woods... Congrats again brother..
Congrats buddy!!! 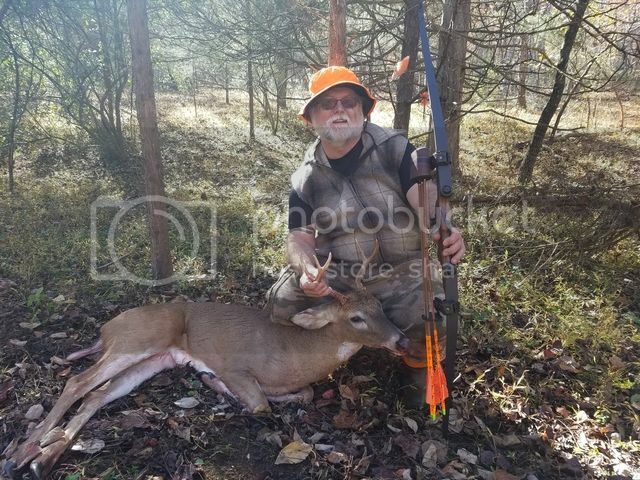 Nice deer and nice tale!